Sea to Summit Ember EbIII 20 Down Quilt. An Ember quilt can be an ideal option for bikepackers, ultralight hikers and travelers. A well-constructed quilt means freedom: Freedom from the weight of a sleeping bag zipper; freedom from the constrictive shape that comes with some sleeping bags. The Ember™ Series takes the simplicity of the quilt concept a step further. The high quality 850+ loft Ultra-Dry Down and 10 D outer / 7D inner shell material mean incredibly lightweight and tiny packed size. The snap-on attachment straps keep your quilt located on your sleeping mat, while the drawcord base of the 40°F and 30°F give the Ember a ‘shape-shifter’ function: wider at the base for more freedom of movement when it’s warm, snugged down when it’s cooler. IS THE EMBER QUILT…? Suitable for cold-weather use? 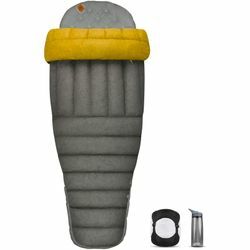 The warmest Ember 20°F has a sewn-in foot box, and is designed for temperatures a little under freezing (with an appropriate sleeping mat). Quilts do not have hoods – you will need a warm hat on chilly nights. Rated using the EN temperature test protocol? No. The EN test does not apply to quilts; so not quilt on the market will have an EN rating. We refer instead to a ‘lowest comfortable temperature based on comparable Sea to Summit sleeping bags. Able to be coupled with another Ember Quilt? Yes. The press-studs along the edge of the quilt (usually used for the sleeping mat attachment straps) can be used to join two Embers together. Construction - 40°F: Sewn-through construction. Drawcord in the foot section. Open up to a quilt or cinch tightly to create a ‘foot pocket’. | 30°F: Box-baffles throughout. Drawcord in the foot section. Open up to a quilt or cinch tightly to create a ‘foot pocket’. | 20°F: Box-baffles throughout. Sewn-in foot box which slips over the end of your sleeping mat.